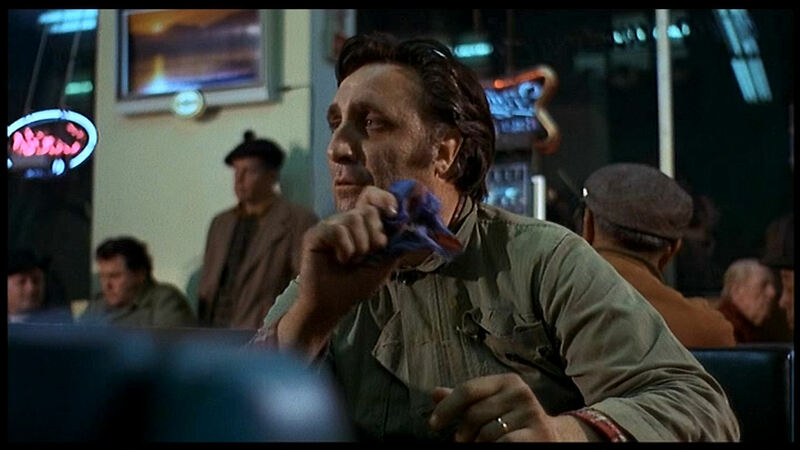 The work week ends with another look at Morgan Morgan, the lonely vagabond of John Cassavetes‘ Minnie and Moskowitz (1971). Moskowitz (Seymour Cassel) encounters him at a late-night diner near the start of the film. He is quite a character, to say the least. As engaging as the rest of the film is, you spend it half-hoping that Morgan will turn up again. That’s the mark of an actor with true presence. This entry was posted in Film and tagged john cassavetes, minnie and moskowitz, seymour cassel, timothy carey. Bookmark the permalink. While I do love the film M&M, I was so disappointed that TC was basically a cameo (albeit an awesome one). That speech is something else! Agreed! I would have loved to have seen him pop up again, maybe at the end. Hey, Marisa, I remember MINNIE AND MOSKOWITZ from when I was a kid and my older siblings would take me to art-house flicks and Martin Scorsese films! Thanks for this blast from the past! WHOA, that’s cool!! Thanks awfully for the heads-up! !